Dr. Ardia’s research is focused on evolution of life histories in birds, particularly at the interface of physiology and behavior. He is especially interested in the how environmental conditions drive life history tradeoffs. 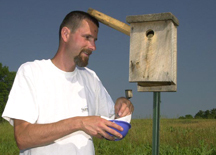 A recently funded NSF award will allow investigation of how tree swallows cope with stress and environmental harshness across North America. In addition, he is studying how house sparrows adjust physiologically to novel environments using multiple invasions in Senegal and Kenya. He also has long-standing interest in the causes and consequences of variation in egg temperature and incubation behavior. Ardia’s teaching includes Evolution, Conservation Biology, Behavioral Ecology, and Tropical Field Biology. Deeply committed to a liberal arts education, Ardia incorporates multiple undergraduates in his research and helps guide students to graduate programs in organismal biology. He serves as an Associate Editor of the Journal of Animal Ecology and the Journal of Field Ornithology. Service in his local community includes serving on the board of the North Museum of Nature and Science, Millport Conservancy, and the PA Master Naturalist.